Already on FIRE is the just released Upper Deck Series One. Collectors have been anticipating this set since the season started because of a young rookie by the name of Connor McDavid. 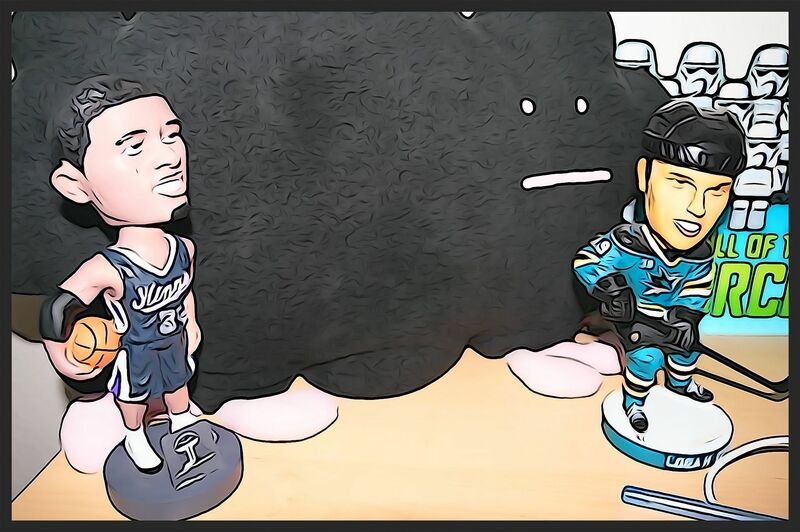 Just about everyone is clamoring for his Young Gun rookie card. And even though he recently suffered a significant shoulder injury, that hasn't stopped collectors from paying well over a hundred dollars for his RC. 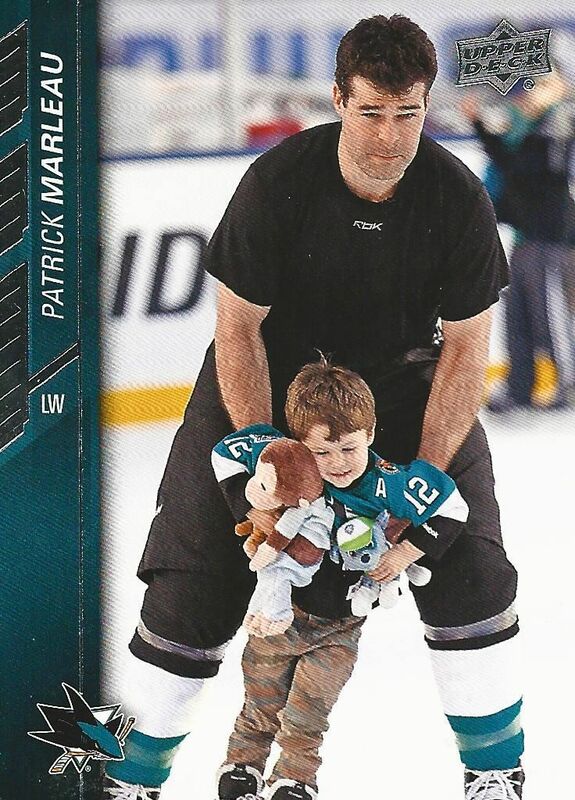 Upper Deck simply knows how to make cards. The main Upper Deck set of Series 1 and 2 always seem to have classic and clean designs paired with the best photos you could ask for - and that's the case again with this year's set. The base cards this year have a team colored border with some nice simple graphic elements. Nothing is overly flashy or busy, but the card isn't too simple either. I'd say it's just right. 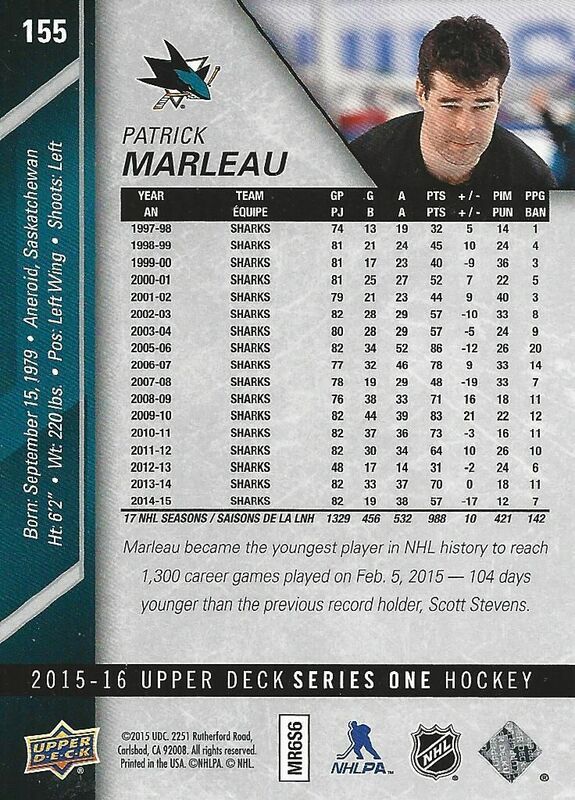 It amazes me how well Upper Deck has got this card making formula down for Series One. This year's base design is a little reminiscent of some of Upper Deck's best looking base sets in the 90's. And those were some of the best looking cards ever made. The back of the base cards are also a classic Upper Deck design. It's easy to read and perfect for looking at a players career stats. Unlike higher-end base cards, these don't skimp on player information. If you're looking for cards that are comprehensive and downright historical, you don't have to look any further than this. 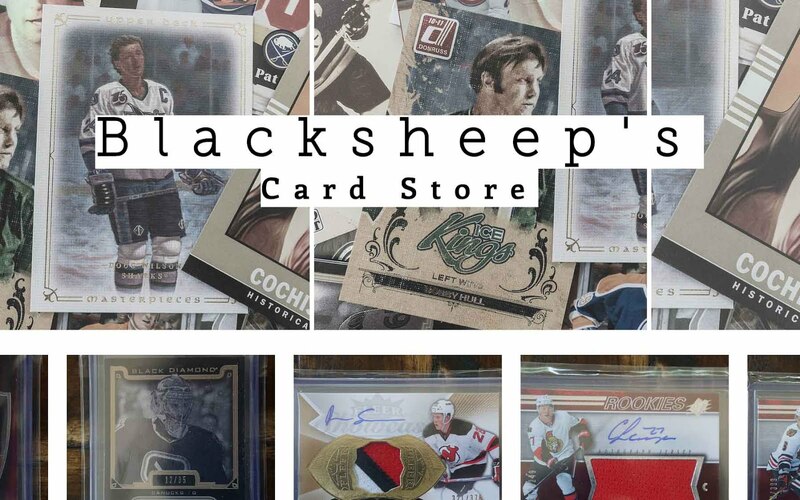 Upper Deck Series One puts the puck in the net with amazing photographs that represent the hockey season on their card fronts, and gives complete statistics of the players in the NHL. If there was any set that could be called a yearbook for the NHL, this would be it. It's like, perfection. Young Guns this year are given a very nice design scheme. Like the base cards, the Young Guns are very photo-centric. I almost feel as if the Young Gun logo has been made a bit understated. Personally, I enjoy Young Gun cards that are flashy and bold. So these are a bit tame for me, but I'm sure many collectors will like these a lot. I can see this set of Young Guns being a future classic, especially if Connor McDavid lives up to the enormous hype that surrounds him. Upper Deck Series One is about the most middle of the mid-range products that you can find. Each box will yield a smattering of inserts, some parallels, and a memorabilia hit. Lucky collectors may find an autographed card too. But the main draw of UD1 are the Young Guns. Each box will pop out six of them. Though Young Guns don't feature an autograph, memorabilia, or serial numbering, they are one of the most sought after and collected card types in the hobby. I'm a big fan of how Upper Deck still makes an effort to print out quality insert cards. Each year collectors can enjoy finding different types of inserts when the purchase Series One. This year's Portraits insert is a nice change of pace to the base cards. These cards feature a white frame with a close-up photograph of the player. They will most likely not be huge money type cards, but they are fun to get and do a great job of mixing things up when you open up packs. I got quite a few of these in my box break. This year's Shining Stars Insert set looks awesome with its shiny foil front. These cards really stand out in the set with its high-quality design. Like with many of the Series One inserts, these come in different versions. 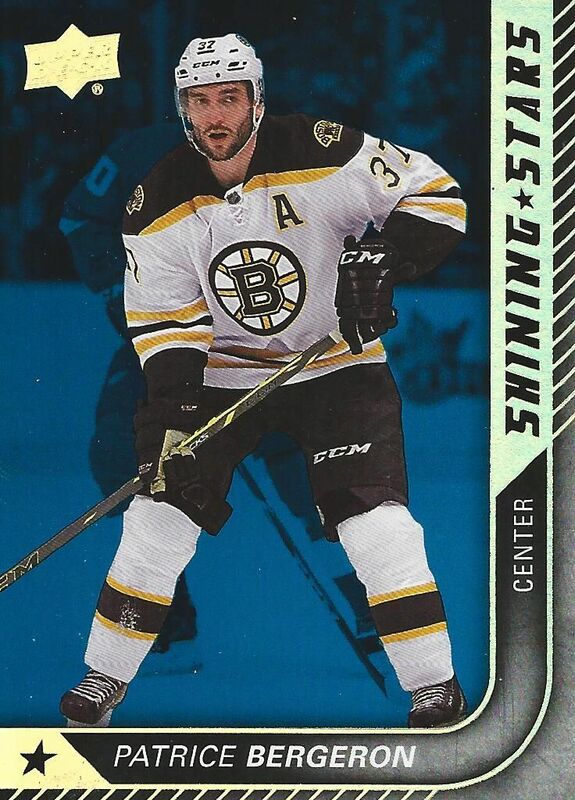 The Bergeron card shown above is the blue parallel version. Check the back of the pack to see the exact odds of all the different variants. It's always great to see the UD Canvas cards again. These cards are more than just parallel cards as Upper Deck provides completely different photographs for these cards. Often times the photos on these cards stand out even more than the standard set - and that's saying something! UD Canvas Young Guns will most certainly be as popular as ever this year. My only complaint about the cards is the UD Canvas logo itself. It just doesn't look 'right' to me. Perhaps it's the font... I just want something a little more ornate than what it has. But other than that these are again great looking cards. UD Exclusives are the more direct parallel to the main set. These cards are the exact same as the base set except for serial numbering and a special UD Exclusives logo. Each Exclusives parallel card is numbered to 100. 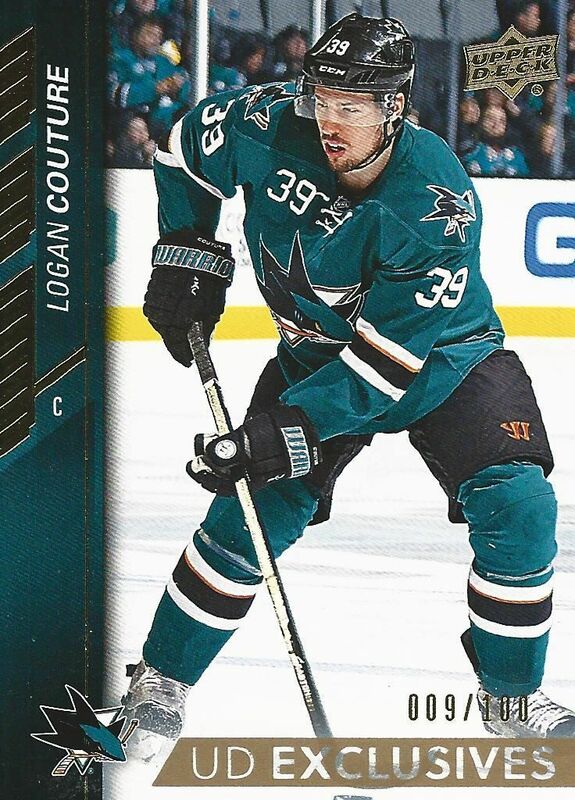 I can't believe the Exclusive parallel I received in my box was Logan Couture. What are the odds of that?!?! Upper Deck boxes used to come with a couple game jersey cards, but now it's just one... and I'm totally fine with that. The jersey cards in UD1 were always just a little bonus to me. This year's jersey set comes with a fresh looking design and a jersey piece that looks to be a little bigger than that of years past. I'd definitely call this an upgrade and a good move by Upper Deck. Unfortunately, I didn't get an autograph in my box, but those are very hard pulls. Upper Deck always loads up boxes with awesome cards for collectors to find. This is just a product that you have to purchase a lot of to get a full appreciation for it. 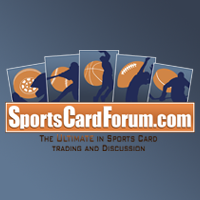 Is Upper Deck Series One a must buy? Ummm... YES. It doesn't matter if you are a collector that owns five mansions, or just a kid with a paper route, this set is worth the purchase. Hockey fans will enjoy these cards no matter what as they offer so much on so many different levels. 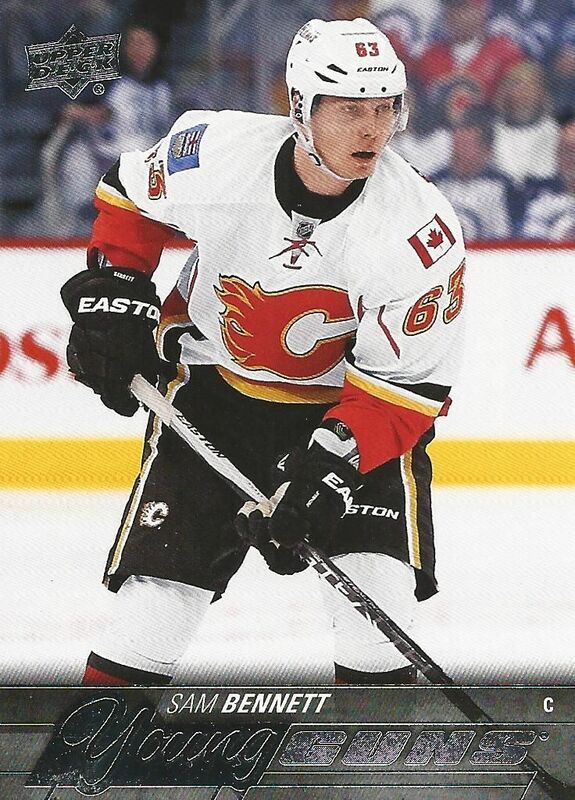 In Upper Deck Series One you will find cards that teach you about the hockey season, you'll find amazing pictures, and you'll also find cards that have high values. It's all there. It's not hard... just go and buy some of this stuff! Everyone else already is. Great break! Now that McDavid is out, I like Larkins chances at the Calder. Not a bad box with Larkin and bennett ! Kinda sad that they bumped up the price so much but still.. Great product ! 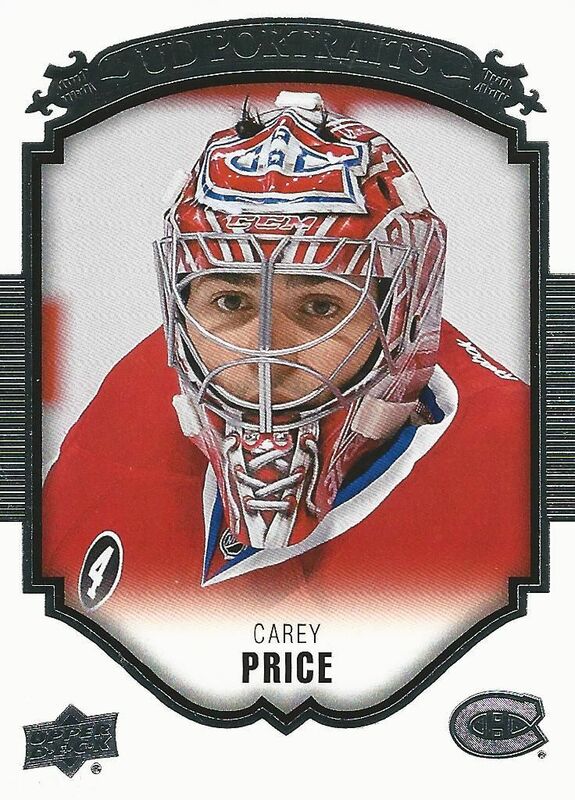 Awesome break, loved the design of the Carey Price card. Everyone wants McDavid's young gun card of course, but since he's injured he might not have a great rookie year. I think that Jack Eichel might win the Calder trophy and Eichel might be as good as Mcdavid in the future. As usual, solid review as well with a couple quality quotes inside - in particular "any set that could be called a yearbook for the NHL". I personally fall in the category of collectors that prefer a more "understated Young Guns. This year's design is on point in my opinion. Nevertheless, I definitely appreciate the opportunity to enter your giveaway. Cheers! Very nice box!! Always love the classic design. Great review!! I've been waiting for this set for a while. Upper deck is always good. A little pricier than last year i believe in Canada but the cards seem to look nicer. Really great break with some of the best young guns to get. wow that was a good box with two of the really good young guns! Nice Larkin!!! As always, nice job!!! Don't really like the base design this year, but really like the photography and the insert designs. Great box! 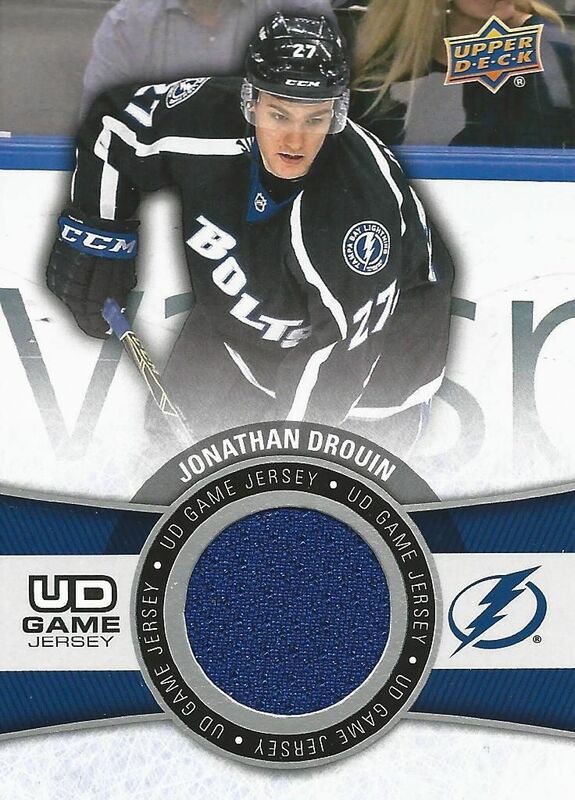 I absolutely love Upper Deck and I like how they changed the look of the UD game jersey cards again! Great Box ! I like that jersey of droin! I love that box, I am going to buy one in the next week. Very nice Drouin and Larkin! This is the best series 1 yet. Series 1 and 2 are nice products year after year. I don't care spending quite a lot of money on those sets since you get something for the money you're investing. The Portraits look great and the YG design is not bad (better than 14-15 but I prefered 13-14). I know that you don't buy Series 1 for jerseys, but I prefered when there were 2 per box. As for your box, nice Larkin and Benett YG. Nice break as always! - The coloured border takes some focus away from the photographs in the base set. - The UD Canvas look starts to get a bit old, so even though I like the concept I would like to see some fresher effect to them.